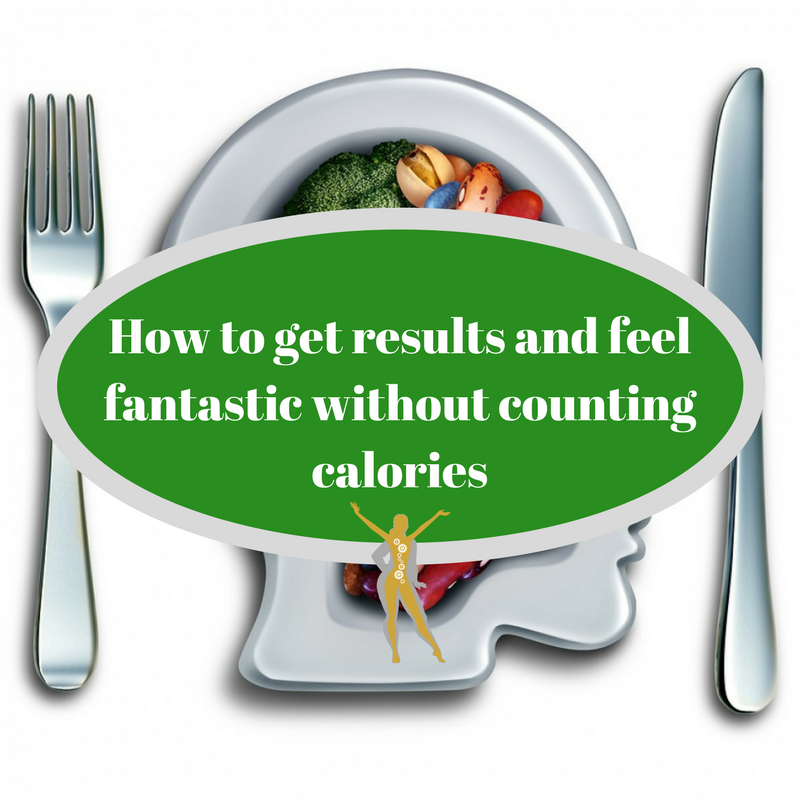 Most people dread the thought of counting calories, it can be tedious and it can steal the joy from food when you begin to think of it only in terms of numbers. 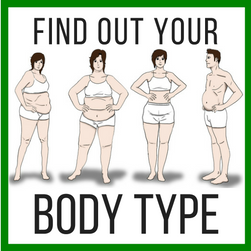 The problem is, when it comes to weight loss, the foundation is very simple. You must create an energy deficit. Meaning you must expend more energy that energy consumed. Calorie counting is merely a tool we can use to measure that. In my opinion, you really only have 2 options. To keep track of your calories, or to learn the skill of mindfully eating. And certainly there are times when it’s useful to use both as you get into the lighter weight ranges or closer to your end goal. How you’ll feel fantastic as a result of practicing this skill. To recognise these signals you need to identify the different stages you move through as you begin to feel hunger. 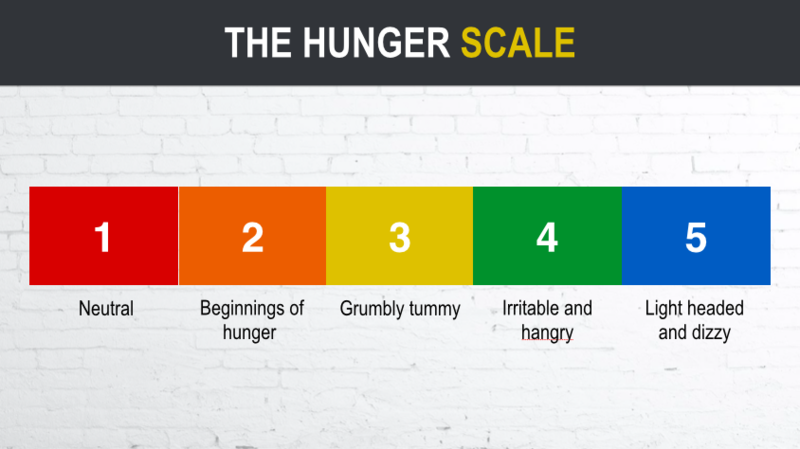 When I teach this skill in the GenHealth Coaching Program we start by using the hunger scale. You need to start eating when you’re at a 3 – hungry but definitely not a 4 and starving. If you are eating at a 2, where you are only starting to feel the beginnings of hunger pains you need to sit on that 2 a little longer and allow it to get to a 3. It’s at this point you need to start moving in the direction of food. If you have prepared a meal earlier, nice work. This is the easiest scenario because it means that you can continue doing whatever you were doing right until you are ready to eat. Just remember to give eating your sole attention and focus while you are learning this skill. when your hormones come into play and take over, It’s no longer a head game, it’s become a physiological one. If you can slow down when you’re eating, and in the beginning if you can stop multitasking while you are eating, then most of you will get the hang of it within the week. You need to stop eating when you are a 2. Satisfied but not full. In my opinion, this is really the most challenging skill to practice. Reason being, there’s something comforting about having a full belly. For some people it can be one of the few times in a day that their body feels safe, secure, and content. And that’s part of the reason why the hormones and mindset modules are such a crucial part of our program. If you are in the weight range between 73kg – 90kg + then you will likely get great results by following the practice of stopping at 3 – satisfied but no more space for more food to begin with. 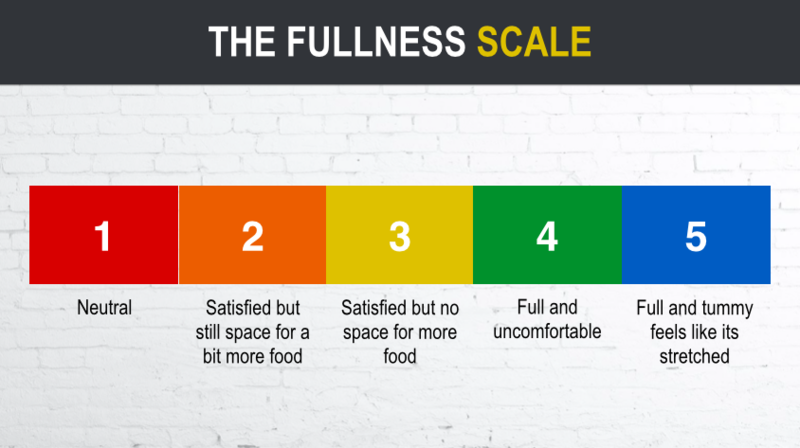 If you are in the lighter weight ranges between 60 – 72kg then you could begin with stopping at 3, and then progress to bringing it closer to a 2 – satisfied, but still space for a bit more food. If you can get into the practice of eating until you are 80% satisfied, meaning that you can leave approximately 20% of the food on your plate that you would normally eat then this will contribute to creating a calorie deficit without having to count calories. After approximately 3 days of practicing this skill, you will feel fantastic. 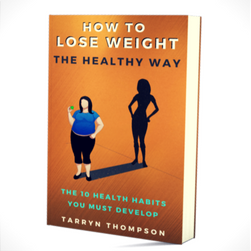 All pointing towards getting results which will feel effortless once you have momentum, and with new found energy, you will feel and look fantastic. Remember that this is a skill, and that it does mean it needs to be practiced. Sometimes you might walk away from your meal a little too soon, so sit on it for 15 mins and if the desire to eat more passes, great. If not, then you probably stopped a little too soon. This process helps us realise that we can confidently know when to stop and start eating, rather than solely relying on external cues like eating at a certain time intervals, using calorie calculators, or even listening to your mother’s voice in the back of your head telling you that you cannot leave the table until your plate is empty for frett of the hungry children around the world who are without. As soon as you stop delegating your food control to these external cues, you will start to realise you possess the ability to eat an optimum amount of food to get results with weight loss, or to maintain your weight once you have reached it. This is one of the many great strategies that we teach on the GenHealth Coaching Program. If you’d like to see more of what we teach, head over to www.genhealthcoachingprogram.com and try our program for $49 a month with all the information at your fingertips, risk free with a 30 day money back guarantee. No Comments to "How to get results and feel fantastic without counting calories"
© 2016 Generation Health. Developed by Pocket Square.